Goodreads Summary: A forbidden romance. A modern mystery. Wuthering Heights as you've never seen it before. 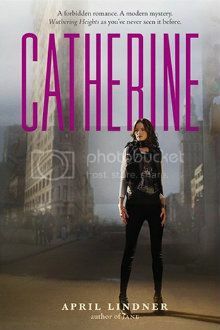 Catherine is tired of struggling musicians befriending her just so they can get a gig at her Dad's famous Manhattan club, The Underground. Then she meets mysterious Hence, an unbelievably passionate and talented musician on the brink of success. As their relationship grows, both are swept away in a fiery romance. But when their love is tested by a cruel whim of fate, will pride keep them apart? Chelsea has always believed that her mom died of a sudden illness, until she finds a letter her dad has kept from her for years -- a letter from her mom, Catherine, who didn't die: She disappeared. Driven by unanswered questions, Chelsea sets out to look for her -- starting with the return address on the letter: The Underground. Told in two voices, twenty years apart, Catherine interweaves a timeless forbidden romance with a compelling modern mystery. I love retellings of classic novels, and this sounds like a really interesting twist on Wuthering Heights. I'm curious to see how it works! I love retellings too. Catherine is going to be awesome.